Eastern head coach Bryan Durst talks with the Lady Eagle infield, during a victory over Waterford on March 29 in Tuppers Plains, Ohio. STEWART, Ohio — Bouncing back in style. 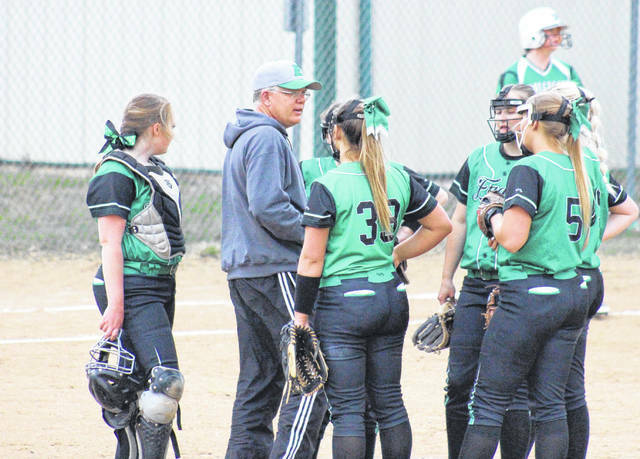 The Eastern softball team snapped its three-game losing skid with a 13-1 victory over Tri-Valley Conference Hocking Division host Federal Hocking on Thursday in Athens County, giving sixth-year EHS head coach Bryan Durst his 100th career win with the Lady Eagles. Eastern (4-3, 4-1 TVC Hocking) took the lead on the fifth at-bat of the game, as Cera Grueser scored on a Tessa Rockhold sac-fly. A two-out single by Kennadi Rockhold gave the Lady Eagles a 3-0 edge, but Federal Hocking got one run back in the bottom half of the inning. Five straight Lady Eagles reached base safely with one out in the top of the second inning, with a RBI single by Kelsey Roberts and a two-run single by Tessa Rockhold extending the EHS edge to 6-1. EHS added one to its lead in each of the next three innings, with RBI singles by Grueser and Kelsey Casto, followed by an RBI double by Roberts. The Lady Eagles sealed the 13-1 mercy rule win in the top of the sixth inning, scoring four runs on the strength of six hits. Megan Maxon was the winning pitcher of record in a complete game for Eastern, striking out one batter and walking one, while allowing one unearned run and one hit. The Lady Eagle offense was led by Roberts, Grueser, Casto and Megan Maxon, each going 3-for-4. Roberts doubled once, scored once and drove in two runs, Grueser doubled once, scored three runs and drove in two runs, Maxon tripled once, scored three times and claimed one RBI, while Casto crossed home plate twice and drove in one run. Mollie Maxon singled once, scored twice and drove in one run for the victors, while Kennadi Rockhold and Emmalea Durst both singled once and scored once, with Rockhold picking up two RBIs. Tessa Rockhold contributed a single and a game-high three RBIs to the winning cause, Alexus Metheney chipped in with a single, while Ally Barber added an RBI. Both teams committed a pair of errors in the game. EHS left 10 runners on base, five times as many as the hosts. The Lady Eagles and Lady Lancers will meet again on April 22 in Tuppers Plains. Next, Eastern will welcome Trimble to Meigs County on Monday.